We’d love your help. 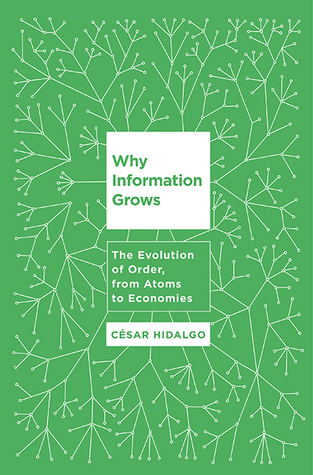 Let us know what’s wrong with this preview of Why Information Grows by César A. Hidalgo. Why do some nations prosper while others do not? Economists usually turn to measures such as gross domestic product or per capita income to answer this question, but interdisciplinary theorist Cesar Hidalgo argues that we can learn more by measuring a country’s ability to make complex products. In Why Information Grows, Hidalgo combines the seemingly disparate fields of eco Why do some nations prosper while others do not? Economists usually turn to measures such as gross domestic product or per capita income to answer this question, but interdisciplinary theorist Cesar Hidalgo argues that we can learn more by measuring a country’s ability to make complex products. In Why Information Grows, Hidalgo combines the seemingly disparate fields of economic development and physics to present this new rubric for economic growth. He believes that we should investigate what makes some countries more capable than others. Complex products—from films to robots, apps to automobiles—are a physical distillation of an economy’s knowledge, a measurable embodiment of its education, infrastructure, and capability. Economic wealth accrues when applications of this knowledge turn ideas into tangible products; the more complex its products, the more economic growth a country will experience. To ask other readers questions about Why Information Grows, please sign up. Something that is absolutely essential to understand this book, subtitled 'The evolution of order from atoms to economies', on the fascinating topic of the nature of information in the world, and its relationship with the economy, is that the author is an academic at M.I.T.’s Media Lab. When I first got involved in IT in the 1970s, we were in awe of the Media Lab and all the ultra-clever, way-out technology concepts that they rolled out, convincing us that we were seeing the future in the visiona Something that is absolutely essential to understand this book, subtitled 'The evolution of order from atoms to economies', on the fascinating topic of the nature of information in the world, and its relationship with the economy, is that the author is an academic at M.I.T.’s Media Lab. When I first got involved in IT in the 1970s, we were in awe of the Media Lab and all the ultra-clever, way-out technology concepts that they rolled out, convincing us that we were seeing the future in the visionary work. But over time, none of their concepts really seemed to become a reality. They might have inspired others, but they continued to be ultra-clever, way-out oddities that rarely managed to cross the divide to the real world. I felt the same about this book. It started out, like a visit to the Media Lab, as a dazzling mix of information theory and economics and philosophy - but in the end it all appeared to be on the surface. It never really got anywhere. And along the way it was often repetitive to the point that I strongly felt that I was being talked down to. I suppose it's a big point to make, but the author repeats the importance and presence of information so many times in the first few chapters. He also makes statements that just aren't true. He says, for instance, in one of those tedious personal story examples American authors seem programmed to start chapters with that his daughter's birth was 'facilitated not by objects, but by the information embedded in those objects'. What he really meant was 'by objects and the information embedded in them' because the information alone wouldn’t have achieved the goal. There’s a fuzziness here in the expression of the thesis, combined with not particularly effective examples in explaining, for instance, the relationship of information theory and the second law of thermodynamics that gives the book a feeling of something that is imagined to be a lot more effective than it really is. It’s not a bad book in intent. It is really important to think about the nature of imagination, and the idea that the manufactured objects we use are ‘crystallised imagination’ would be excellent if we were only told it once, rather than what felt like 50 times. It’s also interesting to consider how imagination has shaped our modern world and how it has an impact on national economies. But the Media Lab treatment, rather than illuminating, dazzles us to the extent that it’s hard to see what lies beneath. Things get a little better, if duller, when Hidalgo focuses primarily on economics - though here the clear flaw is in the description of economics as a science (can anything so inconsistent be a science? ), which comes through strongly. What is well worth doing is the examination of why different parts of the world have very different economies, though I don’t think Hidalgo gives enough consideration to aspects like natural resources, stable and (relatively) uncorrupt government and health. Leitura rápida, mas densa e cheia de novas ideias. Uma explicação breve sobre o que é informação, a diferença para significado, nada que o A Informação não tenha feito em mais detalhes. Mas é só uma introdução para a grande explicação que vem em seguida, como a informação se acumula em sistemas através de sólidos (algo que nunca tinha lido antes, se tiverem mais sobre, quero) e como cresce dessa forma. Vai me fazer ler o O que é Vida? O aspecto físico da célula viva, seguido de Mente e Matéria, Leitura rápida, mas densa e cheia de novas ideias. Uma explicação breve sobre o que é informação, a diferença para significado, nada que o A Informação não tenha feito em mais detalhes. Mas é só uma introdução para a grande explicação que vem em seguida, como a informação se acumula em sistemas através de sólidos (algo que nunca tinha lido antes, se tiverem mais sobre, quero) e como cresce dessa forma. Vai me fazer ler o O que é Vida? O aspecto físico da célula viva, seguido de Mente e Matéria, e Fragmentos Autobiográficos pelo poder de dedução de Erwin Schrödinger. A outra parte do livro usa esses princípios para descrever como cresce o conhecimento humano, passando pelas etapas do conhecimento individual e do conhecimento acumulado em redes. Mais um livro para olhar para a situação econômica do Brasil (desde sempre, não a recente) e ficar desanimado. A maneira como ele integra redes de produtos, serviços e economia é reveladora. Mais um dos livros que gosto, que descrevem fenômenos complexos como sistemas com propriedades que podem ser entendidas. Ainda casou muito bem com a leitura recente dos últimos livros do Fukuyama Francis. Why Information Grows (WIG) describes the evolution of physical order in natural, social, and economic systems. By focusing on the evolution of information WIG reduces the evolution of economies to a particular case of the evolution of physical order in the universe. The book starts by emphasizing that the growth of physical order in the universe is non-obvious because of the second law of thermodynamics. The second law of thermodynamics is the tendency of physical systems to average out, making order disappear. This sets up the defining question of the book: how our planet continues to beget order, complexity, and information in a universe that is so hostile to it? The final answer is simple. In both physical and economic systems the growth of order involves the co-evolution between information—physical order—and computation—the capacity of a system to process information. Accumulating information and computation, however, is not easy because systems have a finite capacity to accumulate both information and computation. The finite capacity of systems introduces hurdles that limit the growth of information in the universe until the universe finds ways of overcoming these hurdles. The main way in which the universe overcomes the finite capacity of systems to accumulate computation and information is by creating networks that allow smaller systems to distribute the computation required to process information in larger networked systems (think of multi-cellularity in the case of cells or teams and firms in the case of humans). __Part 1: This part focuses primarily on the growth of order in physical systems. Chapter 1 explains the ubiquity of physical order by noting that the main difference between our world and that of cavemen is in the way in which matter is arranged (the atoms in our planet are basically the same). This illustrates that our society and economies are built of physical order or information. The chapter concludes by making a strong distinction between information—understood as physical order—and information understood as messages (which are a particular use case of physical order). Chapter 2 describes the definition of information used throughout the book. This definition deviates from the work of Shannon (which is also explained in this chapter). This definition of information emphasizes physical order over the raw number of bits needed to communicate the state of a system. The chapter also explains the differences between Shannon and Boltzmann’s definition of entropy and introduces a definition of computation. Chapter 3 explains the physical mechanisms that allow information to grow in the universe despite the second law of thermodynamics by reviewing literature on out-of-equilibrium statistical physic systems, and in particular, the work of Ilya Prigogine. __Part 2 focuses on the types of information that we accumulate in society and the economy. Chapter 4 emphasizes that much of the information that makes up our economy comes from human imagination and reinterprets international trade, and traditional stories of natural resources exploitation, in the light of an interpretation of products as “crystallized imagination.” Chapter four also tells the story of media lab inventors that translate their imagination into reality, and how the process of invention highlights the value of knowing how to make over the things that an inventor makes. Chapter 5 asks why humans create the objects that they imagine. That is, the chapter explores the social and economic benefits of the creation of products. __Part 3 describes the mechanisms that limit the ability of people to create the networks we need to accumulate the computation we require to make the products described in Part 2. Chapter 6 explains that we need to form networks because individuals have a finite capacity to accumulate knowledge (the personbyte theory). This chapter also discusses explicit and tacit forms of knowledge (and defines tacit knowledge as knowhow). Chapter 7 asks what limits people’s ability to form the networks we need to accumulate knowledge and knowhow by reviewing the transaction cost theories of Coase and Williamson. Chapter 8 notes that transaction cost theory is incomplete because the networks people form are embedded in pre-existing social interactions. This chapter uses the literature in economic sociology and social capital to explain how informal institutions, such as trust and family relations, shape the size, composition, and adaptability of the networks that people form. __Part 4 brings in data on the industrial structure of countries and regional economies and shows how patterns in this data can be explained as a consequence of differences in the computational capacities of countries and regions. Chapter 9 shows that economies that are less diversified tend to produce subsets of the products made by more diversified economies (because they can only form relatively small networks, and hence, are limited in their ability to accumulate computation). The chapter also shows that countries and regions have a tendency to diversify towards related varieties, as the computations they know how to collectively perform constrain their patterns of diversification. Chapter 10 reviews the classical literature in economic growth, reframing it in the context of information and computation, and explains why economic complexity is different from traditional factors. Chapter 11 discusses the differences between the mechanisms used to transfer computation (knowledge and knowhow) in biological vis-à-vis economic systems. Chapter 12 summarizes the book and concludes. This book is a bit like a half-baked cake. All ingredients are there to work out a new, improved taste based upon an extended recipe. But it has not quite finished. The book is about the role of information in the world and it is supposed to take us all the way from the atoms to economies. In particular, the idea was to build up a new theory of economic growth as a result. I would argue, it takes us from atoms to products and social networks required to build those products. But the author either This book is a bit like a half-baked cake. All ingredients are there to work out a new, improved taste based upon an extended recipe. But it has not quite finished. The book is about the role of information in the world and it is supposed to take us all the way from the atoms to economies. In particular, the idea was to build up a new theory of economic growth as a result. I would argue, it takes us from atoms to products and social networks required to build those products. But the author either has lost his interest or ran out of explanatory power in relating these phenomena to the economic growth. His interpretation of the information theory and its consequences is very elegant: information is the order frozen in the matter. Respectively when we create something new, we are “crystallising our imagination” in our product. This enables other people use the benefit of our imagination and “augment their capacities” without the detailed knowledge of the process. His example is toothpaste - we do not need to know how to synthesise the chemicals into a toothpaste to be able to clean out teeth. This is because someone has done the synthesis for us. In his view, that we develop out products because we just want to share our imagination with others in such a way. Also as a person is finite, he/she could accumulate a limited amount of knowledge. He calls in “personbyte”. So to develop something more complex than a single personbyte, people would require a social network. Those networks are evolving in terms of the companies and other organisations, predominantly of the large size. The conclusion is that we have production driven societies rather than consumption driven societies. Also the market does not play such a huge role now, as the majority or interactions are either happening inside an large organisation or between them. And we shape our society in response to what we produce. Respectively, “The economy is the system by which people accumulate knowledge and knowhow to create packets of physical order or products that augment our capacity to accumulate more knowledge and knowhow and in turn accumulate more information.” We become rich because “we crystallise our imagination”. Up to now, all of this is consistent and logical. Some of it reminded me Marx’s “base and superstructure”. One can disagree with the conclusions he has reached. But it is based upon his analysis and understanding of the system. But after that the book is much less convincing. For example, he postulates: “Growth of economies is a consequence of the growth of information.” And so? Is the growth desirable? Is it inevitable? Can we control it? Would it stop one day or would it go all the way to a singularity? What is the role of energy (as we need energy to produce information)? How does it affect the growth? All of these questions are not even raised properly in the book. There is a conversation why some countries are growing better than the other. And the answer is the diversity of their economies and power of their social networks. But it looks almost obvious to me, that it would be such a correlation. I am not sure what does it add to the formulation of the relevant policies though…. Interesting and elegant first part about the physicality of information. But somewhat convoluted writing and rushed arguments in the second part about economies. This was unlike any economics book I have ever read because it focused on information and entropy to explain not just how matter behaves, but our economics systems as well. Even if in the end this fails to explain the evolution of our economies, it seems like exactly the right lens through which to view the question. Think about our best hypothesis for the evolution of the first living cells. Answering the question, "How did life emerge?" was, and remains, a hard question to answer. Our best guess as to how life began came from Bill Martin, Mike Russell, and Nick Lane when they asked the question, "Where did the energy to make these first cells come from?" Unless researchers are looking at the thermodynamic process, which ties a system to the ultimate energy source (our universe), they run the risk of telling "just so stories." Researchers might come up with methods, but if those methods cannot account for the energy needed to build a system or a way in which the system is able to resist entropy, that method is likely wrong. When answering the question, "How did our economies evolve?," attempting to understand and explain it in relation to the laws of thermodyanamics seems like a very promising start. We know that living systems (cells, plants, animals) remain alive because they resist entropy. That is, they continue to be ordered for their lifetime. They do not immediately dissipate all their energy into the universe. Energy is trapped inside each system and helps the system remain active, reproduce, and create waste products that serve as nutrients for other systems (e.g. plants make oxygen waste products that animals ingest; in turn animals make carbon that is ingested by plants). These systems go about resisting entropy for a while. We call that while a "lifetime". The question is, "Are economies also pockets of information that grows over time? Are they systems that resist entropy for a time?" Hildalgo suggests that in a way, they are. Or, at least they are the byproduct the pockets of information known as humans. It makes a kind of intuitive sense that systems we create (or that some might argue "emerge") would be governed by the same rules of thermodynamics that govern us. Our Earth is a system that temporarily resists entropy. Its volcanic core (which keeps Earth hot and spinning), its position in the solar system, and the continual energy fed to it by the sun keep the system we know as Earth in the state of being active. It serves as a pocket in space that traps information and will grow that information until it is destroyed (eaten by the sun, crashed into by a large object, etc). In turn, the earth houses many other living pockets of information -- including cells, plants, and animals like you and me. All of these living things serve as information traps. The machines we human animals made also serve to resist entropy as they trap information for a while. It seems that our economy as well might be a similar system. The economy is our way of processing the information we have grown thus far. Hildalgo describes the economy in terms of an arms race between acquiring information and processing it. When it comes to the economy, the universe uses the same rules to over come limitations of the growth of information or the processing of information that it uses for other systems. Namely, the universe creates networks. I think invoking networks is a fairly safe bet. What doesn't work like this?! Hildalgo does a nice job of explaining thermodynamics to the non-scientists. I found the discussions of computation a bit harder to digest. He didn't use jargon, which I appreciated, but I would have liked more handholding. I feel certain I am going to need to think about this book, do a bit more research, and reread. This is a wonderful book. The way it introduces information and entropy is refreshing and clear. I don't think I ever read such an intuitive explanation of entropy, (at least a one that goes beyond entropy as disorder). It also provides an interesting and new perspectives of what economy is, and how to measure it. More than just being an alternative approach it's quite complementary, and specially convenient for the times we live in which we have a lot of data about all the data we have. Yes it's This is a wonderful book. The way it introduces information and entropy is refreshing and clear. I don't think I ever read such an intuitive explanation of entropy, (at least a one that goes beyond entropy as disorder). Yes it's also a book about data,… and it doesn't mention "Big Data". Thanks for that César. It's also a book about technology and yet the word barely appears (César instead uses a very poetic name the reader will find beautiful and appropriate). One of the main concepts introduced in this book is that of economic complexity, an index that can be applied to regions, industries or companies. And yet the author doesn't give a definition of it (he gives a hint, enough to show that the index is difficult to define in bare words). Well, he could have used an appendix to provide a definition! Then the author claims this index predicts future rates of growth (in conventional economic terms). Yes, it shows how that correlation exists between the economic complexity index measured for countries in 1985 and present rates of growth. Bu that's just one correlation, it's far from enough. Ok, he believes on his index,… thus the natural next thing to do is to show current values of economic complexity for countries, and thus give us a prediction of future economic growth (and with that, an option of testing the prediction). Mysteriously enough the author doesn't provide that information either. (Note the negative synergy of the lack of a formal definition of the index, and the lack of the current data… specially when claimed that the index predicts our future). "As I […] tried to escape the rhetorics of deprivation, guilt, prosperity, optimization, equilibrium, and wealth, I learned that economic growth was nothing more than an epiphenomenon of a larger, more universal, and more relevant phenomenon. This is not the growth that captures headlines and political agendas, but the growth that makes possible the existence of life and society— even if we ignore it. This is the growth of physical order, or information. Soon I had to accept that information was what it was all about. At this point, I could no longer see the economy in terms of income, regulations, and agents. The economy was a mundane manifestation of something deeper." Gaps or no gaps, I thoroughly recommend this book. tl;dr - The author loves networks. Nodes plus paths equals insight. Were I to recommend this book, I'd suggest you start with the last 'chapter' -- the acknowledgements. It frames the book as a story and helps breathe some context into a partially discontinuous collection of ideas. There are good things here, though. It starts with an understanding that information necessarily arises spontaneously in systems out of equilibrium. So while the universe as a whole is gaining entropy, we on Earth and a tl;dr - The author loves networks. Nodes plus paths equals insight. There are good things here, though. It starts with an understanding that information necessarily arises spontaneously in systems out of equilibrium. So while the universe as a whole is gaining entropy, we on Earth and at our earthly timescale have a sun giving us the energy which produces order. Once humans arrive on the scene, we bring the ability to crystalize imagination as physical objects that started as mental constructs. This is what sets us apart from other life. But information has bounded limits which can not be contained within a single organism, giving rise to the "personbyte" (most a human can hold) and "firmbyte" (most a collection of humans can hold). Economies are the flow of information and imagination between social networks. The more trusting a social network, the larger and more flexible it will be. The more familial a social network, the stronger and smaller it will be. In both cases, the flow between networks is neither seamless nor instantaneous. Which is why Silicon Valley is what it is and where it is, and why Nebraska won't be duplicating it any time soon. Not the fault of the author, but the apparent state of the art for a good economic model is barely able to explain history, and basically incapable of providing direction. Knowing that, it's a wonder we get so worked up about GDP. But since it's a thing we can measure, and a yardstick to compare ourselves to others, it makes a kind of sense to care a great deal about how CountryA is doing compared to CountryB. Which brings me to what I learned, and which is not discussed in the book. First, that the actor at the measured scale (students and exams, teachers and Common Core, universities and graduation rates, nations and STEM employment) will eventually focus only on improving the thing being measured and not on the thing that measurement stands for (high value goods and services, high income employment). Second, that the bad actor will always look for a way to game the system simply because if they're succeeding on the scale of what is measured then they will be perceived as winning regardless of how short-sighted that manipulation might be. This is an enormously conceptual book, and is more about economics than information. The author makes the claim that the functionality and ordering of atoms (?) in physical products is information, and this grows with economies. A computer is only worth more than the plastic and chemicals its made out of because of the order in which it was assembled, and that order is information (or "crystallized imagination"). Thus, we don't export products at all -- we export information. Information grows in This is an enormously conceptual book, and is more about economics than information. Information grows in response to networks. We combine our information with the information of other people, other companies, and other countries to create more complex information. He calls the amount of knowledge we can cram into a single person as a "personbyte" and the amount we can cram into a single company as a "firmbyte." To exceed these limits, we have to create networked connections between people and companies. The book is easy to read, but hard to follow. I found myself breezing through chapters, egged on my the author's light writing style, but then getting to the end of a chapter and thinking, "Wait...what?" You'd almost have to read it twice. The book proposes and builds on a topic that stayed on the outskirts of my understanding. At any given time, I had a vague idea of what the author was discussing, but my understanding was never crystal clear. Despite that, I enjoyed the ideas presented. They were mind-expanding, and encouraged me to think about information in a way that I hadn't before. Also of note -- the acknowledgements are wonderful. Rather than just a dry recitation of names, the author discusses the process of writing the book. As a writer myself (Deane Barker), I loved the process he detailed. Interesting book and enjoyable read overall - Hidalgo cobbles together physics, biology, information theory, sociology and comes up with a unified view of economic development as an epiphenomena on top of growth of information. Cute, but terribly fuzzy on the edges, as to be expected from any unified theory. He starts off with a soft dive into information and entropy, and confuses things quite badly. He attempts to reconcile physical (Boltzmann) and informational (Shannon) views of entropy, admit Interesting book and enjoyable read overall - Hidalgo cobbles together physics, biology, information theory, sociology and comes up with a unified view of economic development as an epiphenomena on top of growth of information. Cute, but terribly fuzzy on the edges, as to be expected from any unified theory. He starts off with a soft dive into information and entropy, and confuses things quite badly. He attempts to reconcile physical (Boltzmann) and informational (Shannon) views of entropy, admits that they aren’t exactly compatible, and then proceeds to use the term “information” in a sense opposite of Shannon’s. In Shannon, random noise requires the most bits to encode (max information) while Hidalgo’s central theme is framing information as encoded in physical highly organized state, opposite of random noise. Of course Hidalgo’s usage of the word is more in-line with colloquial use and understanding, but hijacking Shannon’s term and then inverting its meaning was a tad annoying. Hidalgo views growth of information as humanity’s fight against 2nd law of thermodynamics and the never-ending pull of entropy. So, how do we do it? Well, first consider nature, where three tricks come in handy – Ilya Prigogine’s out-of-equilibrium systems, Schrödinger’s aperiodic crystals, and ability of matter to compute. Prigogine’s ideas are pretty nifty – with an input of energy, the order (and information) can spontaneously emerge on the “other side of chaos” (dynamic steady out-of-equilibrium states, such as whirlpools). But how can a temporary order be preserved? In solids of course, as per Schrodinger’s ideas of aperiodic crystals preserving genetic information and what we know today as DNA. And finally there is that uncanny ability of matter to compute that holds it all together (e.g. think of a tree as a computer). The last one was incredibly wishy-washy for my taste, but I ordered both Prigogine’s and Schrödinger’s books. Hidalgo has a nice segue explaining Prigogine’s ideas of life as a consequence of time’s irreversibility, and it being tied to chaos – in a chaotic statistical system even if we knew every physical law and current states, we can’t possibly reverse the trajectory of the process because we would need infinite precision (and information) to get to the initial conditions. The rub is that in chaotic system tiny changes in initial conditions lead to massive changes downstream, and so, since we can’t get infinite precision of current state we can’t reverse chaotic system, and hence we get irreversibility of time and life. I won’t pretend to understand this fully, but you get the gist. OK, back to 3 tricks of nature - Hidalgo proceeds to a more general point that the strategy of embedding information in solids fends off the growth of entropy, and this is where he moves into man-made territory for the rest of the book. He paints all of economic development as growth of information expressed in products, since any product is in the end a physically embodied “crystal of our imagination” (notice the allusion to Schrodinger’s aperiodic crystals here). And it is in this framework that he compares development of different countries as a function of conditions that may favor/disfavor information accumulation. -	Strongly distinguishes between information and knowhow. Information per se is meaningless, you need the knowhow that utilizes that information to make the world go round. Think of DNA molecule vs cell machinery. When it comes to human societies he also distinguishes between explicit and tacit knowledge, along the lines of Joseph Henrich. -	Develops notions of “personbyte” and “firmbyte” and hard limits on information processing at firm and personal level. Hence the need for “links” (between people, firms, industries) to make the information grow. -	When comparing countries in terms of personbytes he falls for Lewontin’s fallacy, expecting variation of skills within a given country be higher than variation in skills between countries. -	Brings in both Coasian theory of the size of the firm as a function of external vs internal transaction costs, and also Fukuyama’s low-trust and high-trust societies. Obviously cheapness of links would matter for both Coase and Fukuyama. -	Nice touch with low-trust societies where “firmbytes” don’t grow beyond small family-owned firms which are fundamentality limited in their capacity to grow information, and so you need the state to step in to develop industries. But then we get inevitable decline into bureaucracy due to the absence of good old price signals. Made me think of sexual dimorphia as applied to diversity of firm sizes in a given country. -	Develops a measure of “complexity of economy” as a predictor for economic growth, as opposed to classic aggregate measures. That complexity is a function of diversity of industries supported, combined with a ubiquity index (commonness of industry X in the rest of the world). Ideally we want high industry diversity combined with a fair share of low ubiquity industries. -	Nice nod to particularism when describing the importance of country-specific industries and practices. In that context education in of itself is not a universal panacea, unless it is aligned with country’s specific industrial needs. Along similar lines what helps in international competition is not just lower salaries, but low salaries relative to complexity of country’s economy. Plausible argument for developing nations, less so for developed ones it seems to me. -	Good musings on biology where DNA (pure info) and cell machinery are cleanly separated and thus are transferrable vs human institutions where information and knowhow bleed into each other at all levels, so transferring a large complex industry is near impossible. In contrast to say DNA or plant seed, an industry would have to be transferred in its “unpacked” form, not fun. Cute example with a failure of utopian “Fortlandia” in Brazil in late 1920s. A counterexample is rocket industry in US after the import of German scientists. Admittedly the ground was pretty fertile in the latter case. Anyway, the book got a few likeable things going for it - short, punchy, plenty of ideas, many don’t stick but you will be entertained. I was. It is not an overstatement to say that this is THE book to read if you want to learn anything about an emerging view of why and how countries grow. A key take-away for me is the importance of assessing development, not in terms of what people can buy, but instead what people can make. This knowledge and know-how, Cesar describes, is embodied in the products that countries exchange with each other. He thus proposes a new way of thinking about international trade as really an exchange of "crystals It is not an overstatement to say that this is THE book to read if you want to learn anything about an emerging view of why and how countries grow. A key take-away for me is the importance of assessing development, not in terms of what people can buy, but instead what people can make. This knowledge and know-how, Cesar describes, is embodied in the products that countries exchange with each other. He thus proposes a new way of thinking about international trade as really an exchange of "crystals of imagination" (i.e., the products that embody knowledge and know-how). As to why some places exhibit more "imagination" or crystallization thereof (or make more sophisticated products) he offers an explanation grounded on the difficulties of fostering "links" to create dense networks from which individual "person-bytes" can be combined to make more imaginative products. Transaction costs make it difficult to bring knowledge and know-how together. Things like a common language help lower these costs and allow diverse people from across the world to collaborate at places like Harvard and MIT to bring new products to life. This has been the most influential book on my thinking since I read "chaos" in high school. It has filled in some gaps that were left by my education regarding the origins of life, and proceeds to use those same principles to describe a very credible intellectual framework to understand the complex underpinnings of modern economic and social evolution. The beauty is that this framework is so basic and pervasive that it can be applied both to national economies / international trade as well as in This has been the most influential book on my thinking since I read "chaos" in high school. It has filled in some gaps that were left by my education regarding the origins of life, and proceeds to use those same principles to describe a very credible intellectual framework to understand the complex underpinnings of modern economic and social evolution. The beauty is that this framework is so basic and pervasive that it can be applied both to national economies / international trade as well as inter-office interactions and team dynamics. The subject is fascinating, but the ideas spelled here are neither new nor interesting. What you'll really learn from this book is that the writer is very clever, extremely knowledgeable and well read; and that he is very fond of himself. Other than that, read James Gleick's The Information, and check out the work Ricardo Hausman's done with Hidalgo in the Atlas of Economic Complexity and you'll be better off. In any case, this book will not change your life. I thought this was a great book. People who are well versed in the field may quibble about points, but it taught me a lot and certainly triggered considerable thought. The author connects the concepts of atoms up through the organization of economic and social systems. It was tough reading--I could handle only ten pages a night--but for a starter in these areas of theories, I respect it a lot. A fim de sustentar essa tese, Hidalgo realiza um preâmbulo sobre a informação em seus contextos físico e comunicativo/computacional. Ele prossegue, dizendo que a natureza (nós, inclusive) é repleta de conhecimento (“knowledge” e “knowhow”) mas que, para que este cresça, é necessária uma base material, tangível e razoavelmente resistente às flutuações do entorno. Com isso, toda a vida e, também, as criações humanas, devem ser encaradas como uma “imaginação cristalizada” (ideia, aliás, que mais me pareceu atraente e original em toda a obra). Somente através de suas fabricações, a informação é capaz de se propagar, de crescer, de se tornar mais complexa. Quanto às partes finais do livro — na qual ele realiza um salto de escala e passa a abordar pessoas e empresas trabalhando em rede como uma forma de facilitar o fluxo e a capacidade de computação de informação — tenho minhas dúvidas. Talvez pelo aspecto de divulgação científica, eu tenha tido a sensação de que o autor buscou fazer seus modelos se encaixarem à sua visão prévia de mundo. Imagino que nos artigos científicos a construção dos seus indicadores fique mais clara e que a aplicação destes não soe como casuísmo. Outro ponto é que Hidalgo não discute o papel de grandes multinacionais e das redes sociais sobre o anuviamento do poder dos Estados e como isso afeta a própria natureza das redes de transações informacionais que constituem a economia em sua visão. کتاب چرا اطلاعات رشد میکند کتاب جالبی است. فصل های اول کتاب سعی میکنه تعریفی از اطلاعات بده که منطبق بر نظریه اطلاعات و ارتباط تنگاتنگ این نظریه با فیزیک باشد و در نهایت با این تعریف به این قابلیت انسان می پردازه که انسان توانایی خلق اطلاعات از تصورات و خیالات خود رو داره . این توانایی را به چیزهایی بمانند دانش مرتبط میکنه . در ادامه سعی می کنه با این تعریف و اهمیت دانش بشری به این مساله بپردازه که چطور انسان با خلق اطلاعات باعث افزایش اطلاعات می شود. فصل های اخر کتاب به این سوال مهم شروع می شود کتاب چرا اطلاعات رشد میکند کتاب جالبی است. فصل های اخر کتاب به این سوال مهم شروع می شود که چرا بعضی تصورات و خیالات تنها در برخی جوامع خلق و ساخته می شوند و از اینجا پای اقتصاد و تاثیر آن بروی دانش و خلق اطلاعات بررسی می شود. As some of the other reviews mentioned: There is a great book hidden here. Has compelling ideas and got me interested in reading more about information theory. But the ideas do not seem very connected, and at times, not very convincing. Most books could be half their size, this one could be double its size. The ideas deserve it. I liked the author's story at the end about how hard this was to write and surely other writers can relate. Maybe, maybe if the limits of real world had given him more time As some of the other reviews mentioned: There is a great book hidden here. Wow. Amazing read. compiling complex notions in a deceptively simple-looking style. In the last few days, when I breezed through the book, I found myself dreaming of things as crystallized imagination. Sometimes the ideas contained may sound lofty, pretentious. When you catch yourself thinking that, stop the book, have a glass of water and read again. It all makes sense. Books are invaluable for the different perspectives they can introduce. This one is fearless in its volume and radicalness. A thought provoking, beautifully explained book bridging a wide range of topics seamlessly. The clarity in the presentation is remarkable. 'Why information grows’, is a very refreshing and insightful read. This intriguing piece of work takes you through a journey of evolution of information, from objects and matter to economic growth and progress of nations. This journey crosses through different disciplines, so it is something readers from a variety of backgrounds could relate to. Cesar Hidalgo, beautifully connects principles of physics, information theory, networks and complexity to understand the emergence of information and dev 'Why information grows’, is a very refreshing and insightful read. This intriguing piece of work takes you through a journey of evolution of information, from objects and matter to economic growth and progress of nations. This journey crosses through different disciplines, so it is something readers from a variety of backgrounds could relate to. Cesar Hidalgo, beautifully connects principles of physics, information theory, networks and complexity to understand the emergence of information and development of pockets of information that lead to economic growth. The style of writing and the flow of stories and examples make it easy to grasp diverse concepts and manage to capture the readers through transitions from concepts of out of equilibrium systems to networks of people and economic complexity. Another important aspect of his new perspective is the importance of imagination and creativity in growth of information. It is the crystallization of our imagination that allows us to make innovations, develop information rich networks that lead to economic boom and it is this capacity that allows us to push boundaries of unknown in any field or discipline. Would highly recommend this book to readers from any field or background. The concepts described here provide deep insights to anyone trying to understand order and processing of information from a molecular level to complex economic systems. +Cesar did a good job quantifying my own observation that a lot of old writing on information theory has much more to do with communication theory than information. +Good popular science format, tying a personal narrative to the theory well. +Economic arguments reminded me a lot of Doug North's work(he does mention NIE but not North's work in particular) and James C. Scott's work, but with a combinatoric programmer friendly way using information theory which I liked. Politically speaking I seem to have many similar biases when it comes to the economy as the author. Take that for what it's worth. I think academics who have dedicated their career exploring and expanding a topic have the soft responsibility to communicate their work to non-experts of their field. Cesar has done that with this short book, which serves as a gateway to the work on economic complexity and product space (swear it was called product forest when I first read about it in the early 2000s) started by him and Ricardo Hausman of Harvard Kennedy School. Cesar noted in the acknowledgement that he intended for this book to be more than that, but the real practical contribution, I felt, still comes from the body of work on economic complexity. The other parts of the book present a more nuanced context of why it is important to look at economies from the perspective of the growth of information rather than than more conventional manner of GDP etc. This is not a book without flaws. It tends to leave you with more questions. And sometimes you can't help but feel that Cesar oversimplifies. But it is okay, because you know if you want to read more and explore further, there is an existing body of knowledge that you can draw upon that is only a Google search away. Although our universe as a whole is developing into states with ever higher entropy and therefore less information, the information around us seems to increase. This is because physical systems far from thermal equilibrium tend to create information rich steady states. This process is fueled by the sun's energy. Furthermore information can be stored in solids and living beings are a good example for this. DNA is a amorphous solid with long range correlations that can encode a lo Interesting book. This book is a must-read for understanding the shape of our world and how its systems grow. To me, the most important section -- and the one that draws most directly on Hidalgo's work -- is toward the end when he discusses the importance of networks. Anecdotally, I've found that networks of people and firms are the key drivers of economic prosperity and, relatedly, the complexity and dynamism of their regional industry. This is, in fact, the heart of Hidalgo's own discovery. Hidalgo is basically This book is a must-read for understanding the shape of our world and how its systems grow. To me, the most important section -- and the one that draws most directly on Hidalgo's work -- is toward the end when he discusses the importance of networks. Anecdotally, I've found that networks of people and firms are the key drivers of economic prosperity and, relatedly, the complexity and dynamism of their regional industry. This is, in fact, the heart of Hidalgo's own discovery. Cesar Hidalgo's redefinition of information as the physical order of things is genuinely refreshing. With this understanding we can model the world through the lens of information theory, which turns out to be powerful. I certainly enjoyed the idea and will likely carry it throughout my life and career as a machine learning researcher. But, as you can tell by the three stars and short review above, it wasn't all to great; past the redefinition, the book was redundant. Hidalgo was not attempting t Cesar Hidalgo's redefinition of information as the physical order of things is genuinely refreshing. With this understanding we can model the world through the lens of information theory, which turns out to be powerful. I certainly enjoyed the idea and will likely carry it throughout my life and career as a machine learning researcher. One of the most interesting reads of the year. Amazing book. Top three non fiction books of the year. Clear, crisp and to the point without endless repetition. Only shortcoming I would say was lack of addressing issue of what happens once information is lost how irfan be regained. Something that especially today's first world countries will have to face soon as they offshore more information ... Know how and knowledge. A fascinating application of the science of order to economic growth. It throws a lot of light on why some countries/regions grow and others don't. Probably not for beginners in this field but a challenging and perspective changing account of the interaction of these two fields. Interesting. But also a little bit if a challenging read in terms of flow. Written by an academic. Feels in a way a paper that was made longer into a book. There are some fair points and nuggets of insight. Learned of via @charlierose show.